Photo at right is of pink Frangipani, also called Plumeria, a native Virgin Islands flowering plant. There are over 300 named varieties and their scent is most fragrant at night. Last night during heavy rains our first meeting took place. Thanks to all for braving the elements, listening and voicing their opinions. Attendance was roughly 80 to 100 members. Channel 2 News was there videotaping. During the Q&A session opinions from members were heated and emotional. Although Richard Borck, the project manager, explained he had put two years of effort into trying to find a workable plan for the property owner, business owners, government and citizens, many members were opposed. Concerns such as lack of parking, distance of parking to the beach, and possible future development by the land owner were voiced. We’re happy to announce our first meeting! The subject is Cane Bay Beach and the proposed re-routing of the road around the beach. Katherine and Frank, owners of Eat @ Cane Bay, have graciously allowed us to hold our meeting at their restaurant. Thank you! Keep in mind the restaurant will be closed and will not be serving food or drinks. Here are few stats to let you know how our website has been doing. Since we started recording stats in April we’ve had 4,923 visitors. The biggest day was 297 visitors. Our most visited page is the Destinations page. The top search terms folks used to find our website have been “rowdy joes st. croix”… the 2nd, 3rd, 4th and 5th terms were “www.northshorestcroix.com”, “northshorestcroix.com”, “fromer real estate”, and “annaly farms”. The top referring website (website folks clicked a link on to get to us) has been Cruzana.com. And finally, the top click from our website has been to Canebaystcroix.com with 62 clicks. And finally, we have 128 members to date. Because of The Avis newspaper article we surpassed 100 members today. In my opinion that’s a great start! In other North Shore news we will soon be adding four new villas to our Destinations page… Estate Belvedere Villa, Villa Paradise at Cane Bay, DragonFly Villa, and the amazing Clairmont Mill. We’re also adding Gone Ketchin’ Sportfishing. We had an email from the folks who publish VI Settlers Handbook, a great resource you may want to check out. And finally, the weather… we have had many good rains and many incredible rainbows over the past month. The North Shore is lush, green and the orange-red flamboyant trees are in full bloom. Our association in the news! Help us by tacking up a flyer. To the right is our North Shore Awareness Flyer. Our hope is that a few of our members will print it out and tack it up in a spot where other North Shore lovers will notice it (e.g. a restaurant, a store, etc.). This may spur others on to join us, and in turn increase our membership. Please click on the graphic at right to view, then print the PDF on your color printer. The size is a printer friendly 8.5″ x 11″. Thank you… every little bit helps! After 30 days we have 75 members. 65 of those members signed up as residents, and 10 as visitors. We continue to get postive emails about the association and the website. As of today our opinion poll (below on this page) has had 55 voters with 70% voting crime prevention as their most important topic, with litter control a distant second. In other North Shore news there was a fire yesterday that burned a few acres of grassland on Barron’s Bluff. This was the same spot as the fire two years ago. St. Croix is dry right now (unlike the photo at the right taken several months ago). North Shore. The Movie Star. In 1994 the movie Shawshank Redemption was nominated for seven Academy Awards (Best Picture, Best Actor, Best Cinematography, etc., etc. ), unfortunately that was also the year of Forest Gump, which swept the awards. Most St. Croix lovers know the beach in Mexico at the end of the movie was actually St. Croix’s beautiful Sandy Point, and not, as they called it in the movie, Zihuatanejo. What most people don’t know is the North Shore was a star long before Sandy Point… by a whole 10 minutes! If you’re planning to visit St. Croix and want in-depth information about the island please visit stcroixtourism.com… The website owners are North Shore members and residents. You’ll find a huge amount of first-hand information about the entire island– airport info, customs, golf, fishing, medical services, real estate and much more. There is so much information here even the seasoned St. Croix visitor might learn a thing or two! We’ve grown to 52 members! It’s another beautiful day on St. Croix – great weather and even some well-needed rain fell last night. The breeze was up today and the sea looked spectacular. Moving on… here’s a quick note to say we are now at 52 members (after only 15 days)! And for those of you who know about upcoming events, weekly dinner specials, live bands, dive trips, special kayak tours, you name it we’ll consider it… please email us so we can add more items to our events calendar. Photographer, plus more new members! 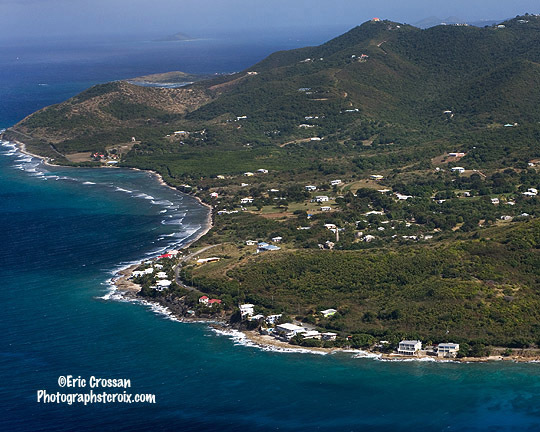 To the right is an aerial photo sent to us by Eric Crossan – a new member, part-time St. Croix resident and professional commercial photographer. This beautiful photo shows a portion of the North Shore from The Waves at right to Salt River off in the distance (click photo to enlarge). Next up… we’ve got a new request to add a rental home called Villa on the Edge, we hope to add them this week, their website is at www.noproblemmon.com. 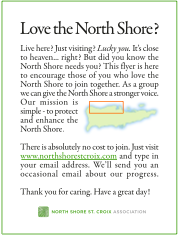 Finally, North Shore lovers keep finding our website… that’s 44 members in our first 10 days! We are currently at 34 members. This is a very strong start! Next we’re looking to add Tan Tan Tours to our Destinations section. For more about the fantastic tours Tan Tan provides please visit their website at STXtantantours. We’d also like to point visitors to a website that highlights “The Good Things on St. Croix” called Cruzana.com, they have made North Shore St. Croix Association one of their featured articles. Another point to mention is that Sita from Bogey’s Bar & Restaurant offered to allow us her restaurant as a meeting place in the future. Thank you Sita! 23 members, 3 new destinations! There are 3 new destinations to add. The first is Villa Dawn, a luxurious 4 bedroom, 3 bath vacation / holiday rental villa… at www.villadawn.com. The second is Caribbean Breeze at Gentle Winds Resort, a luxurious condo rental located on a beautiful white sand beach with fantastic swimming and snorkeling… at www.caribbeanbreezecondo.com. And the third is Blue Vista Villa, a private vacation getaway offering breathtaking 270° views of the Caribbean Sea and Salt River National Park… at www.bluevistavilla.com. Amazing what the North Shore has to offer! 7 new members, 1 new destination! We are on a roll! After checking our email today, Sunday March 29th, we see seven new members have signed up. This is a little surprising, considering we have not told anyone our website even exists. Total membership is now 9 members strong. Our first member, Jodie Mays, has just emailed us a short write-up on Annaly Farms (and attached a couple of photos too)! Thank you Jodie. We hope others will help too… since our association is brand new and there are many destinations to write about we hope local business owners and residents will email more write-ups. We need business articles, destination articles, and calendar events. Thanks again to Jodie for kicking things off!